Dr. Bill Novick:0:00Of the 200 pediatric cardiac surgeons in the US, I would say probably less than 15 percent do this kind of work. Anna Jaworski:0:16Welcome to Heart to Heart with Anna. I'm Anna Jaworski and the host of this program. This is the third episode of Season 13. I'm very excited for today's show to feature a very special gentlemen. Today's show is Healing the Hearts of Croatia, Libya, Ecuador, and Beyond. 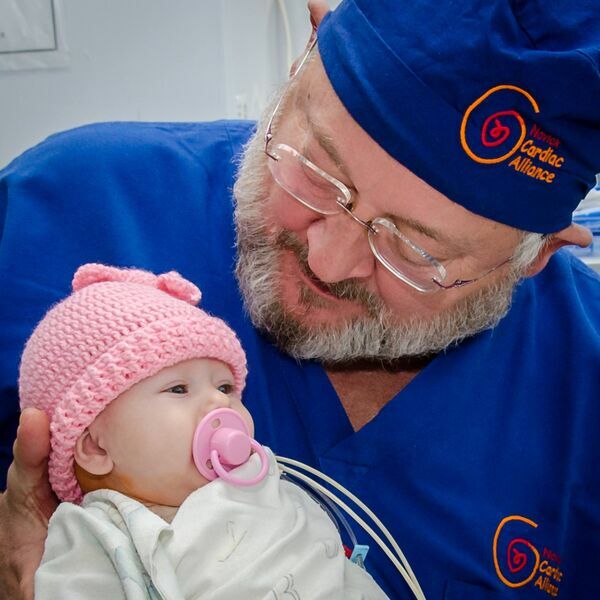 Dr. William Novick is a Pediatric Cardiothoracic Surgeon who has traveled the world saving the hearts of children who otherwise would have been lost to care. Dr. Novick is a published author and has spoken globally about the need for children around the world to have healthcare to mend their broken hearts. In 1994, Dr. William Novick founded the International Children's Heart Foundation, or ICHF. He resigned to begin a new nonprofit, the Novick Cardiac Alliance or NCA. Dr. Novick's nonprofit works to achieve its vision that every child born with heart disease, should have access to the medical care needed to live a long and healthy life. Between Dr. Novick's 21 years working with ICHF and four years working with NCA, over 10,000 children had been operated on in 52 cities and 32 countries. What makes the Novick Cardiac Alliance special compared to some of the other nonprofits helping provide reduced costs or free surgery for children is the belief that the only way children can continue to receive the care they need is to train the doctors all over the world so that after the Novick Cardiac Alliance leaves, there are still people there in those countries who will be able to continue to care for the CHD community. So welcome to Heart to Heart with Anna, Dr. Novick. Dr. Bill Novick:1:56It's nice to be with you. I'm delighted to talk with you about the problems that children around the world with congenital heart disease face. Anna Jaworski:2:04Well, I am too. It's very interesting. As my program has become more global and I've been talking to more people all over the world, it has given me a greater appreciation for the healthcare we have here in the United States and how it's not the same all over the world. So I'm eager to hear what you have to share with us. I know you became a Pediatric Cardiac Surgeon when it was a fairly new discipline, so what made you decide to become a surgeon specializing in the care of children with broken hearts? Dr. Bill Novick:2:38As a high school student, my girlfriend in Pensacola, her father was the leading adult cardiologist in the city. And my dad actually had a myocardial infarction my senior year in high school and my girlfriend's father took care of him. So then once I started college I realized that I still had this interest in heart problems and thought that I would become a scientist quite frankly, to do research in cardiac problems. And as I was in the Ph.D. Program at the University of Alabama, I was working on some research which actually involved uh cardiac metabolism and Dr. John Kirkland, one of the grandfathers of pediatric cardiac surgery, had his own lab and we were collaborating in myocardial biochemistry. So at a very early age I realized that this whole field of pediatric cardiac surgery was fascinating. So when I applied for my heart surgery residency after finishing my general surgery residency at Penn., I applied because I wanted to be a Pediatric Cardiac Surgeon. I knew that when I started medical school, because of my research work with Dr. Kirkland and I pursued that dream in a pugnacious manner until I actually achieved it. Anna Jaworski:3:54Wow. It's unusual for a young man or even a young woman nowadays to be so driven towards one goal and to stick with it like you have. Dr. Bill Novick:4:04That was the start, but there were literally luminaries in my life from that time through college, through medical school, through a general surgery residency, through my biochemistry research projects, so I was fortunate. Anna Jaworski:4:20Wow. Yeah. It sounds like you were. It sounds like you were in the right place at the right time and everything just fell into place. I think when things like that happen, you know it was meant to be. Tell us why you started the International Children's Heart Foundation. Dr. Bill Novick:4:34Well, I was at the University of Alabama and doing my cardiac surgery training, people from all over the world were sending their children for Dr. Kirkland and Dr. Albert Pacifico, my two mentors, to operate on. I think the child that really pushed me over the edge was a child from Nigeria who came at 12 years of age and she had a diagnosis for which the university was famous for repairing. However, the diagnosis was incorrect. She had a severely complex form of heart disease. We were only able to palliate her and the mother was extremely thankful and I never really understood why because she came for total correction, but we only gave her basically a Blalock–Taussig shunt and sent her on her way. For the next six weeks, I had nightmares about this child where I was chasing after her and just as I was about to grab her, she fell off a cliff and obviously was going to die. That was a very impactful six weeks of my life. When a couple of my buddies who were Colombian and we're returning to Bogotá to start their pediatric cardiac surgery programs, asked me if I would come down after they got settled and help them with their two programs. I agreed very quickly and made my first trip to Bogotá in '91 and realized this is what I want to do. So when I came to the University of Tennessee, I came specifically because they offered me the opportunity to build this International program. But I realized that the university wasn't going to cover the costs associated with sending a team around the world as often as I thought I wanted to do it. So I started this foundation, the International Children's Heart Foundation, and we received our 501(c)(3) approval in 1994. Anna Jaworski:6:24You really knew that there were children that just couldn't afford to come to the United States, but that didn't mean that they didn't really need the help. How is your current nonprofit, the Novick Cardiac Alliance and the International Children's Heart Foundation, how are they different? Dr. Bill Novick:6:42Well, I think the major difference that we have is that we believe that the more physicians we can educate and the larger number of children that we can operate on in an annual basis and the more countries that we can provide assistance to on an annual basis is going to result in a greater number of these children being cared for in the future. ICHF, maybe they make 12 or 13 trips in a year. We're averaging around 28 trips a year and averaging over 400 children annually that we operate on. So I think that's one of the major differences. We're very, very much inclined to try and increase our numbers as much as we can. This year we're going to exceed 500. Anna Jaworski:7:33That just amazes me. Wow. Dr. Bill Novick:7:36Yeah, but the year that I resigned from ICHF, that fiscal year, we operated on over 800 children that year. Anna Jaworski:7:44Wow. Really? How many children do surgeons operate on in a regular hospital? If you were working at CHOP, how many children would you operate on? Dr. Bill Novick:7:54Depends on how many surgeons they had, but let's say they had three senior level pediatric heart surgeons. Each one would be doing anywhere from 275 to 325 based upon the numbers that I have that CHOP does on an annual basis. Now I'm not saying I did all 800 of those operations. Anna Jaworski:8:13Right, it's your team. Dr. Bill Novick:8:14So one of our surgeons for instance, was doing about 90 cases a year. Another one was doing about 175 cases a year. Another one was doing maybe 150 cases a year. So you add that up, and I did 400 of those cases that year. Anna Jaworski:8:28So are these doctors who are part of your team actually working at other hospitals and this is just something that they do as a passion on the side or are these full time doctors who work with you? Dr. Bill Novick:8:41If you think about it, how could anybody that has a regular job, I mean a real heart surgeon, anesthesia, whatever job. How could they possibly take the amount of time off every year necessary to carry out 27, two-week trips? Your answer could be, well, you know, 200 pediatric heart surgeon in the United States and geez, you know, all you gotta do is pick 10 or 15 of those guys and you can cover it. Well, you know, the bad news is not everybody wants to do this kind of work and actually of the 200 pediatric cardiac surgeons in the US, I would say probably less than 15 percent do this kind of work. So now you're down to a relatively small group and most of those guys only make one or two trips a year. So with that combination, I have two volunteer surgeons who make anywhere from one to four trips per year. Myself and Dr. Vitaly Dedovich are the two full time pediatric cardiac surgeons that are employed by the Novick Cardiac Alliance. Now additionally, you know I hold an endowed chair at the University of Tennessee and International Child Healthcare as well as a professorship in surgery, so I have some responsibilities at the University of Tennessee, so we take medical students on our trips in order to provide them with some education that they, quite frankly, wouldn't see here in the United States because a lot of cases that we take care of abroad are older children and in the United States, most kids are being operated on in infancy. Anna Jaworski:10:24Right. It's very different. Dr. Bill Novick:10:25Yeah. The whole business of seeing the natural history of un-surgically treated heart disease is something that you just don't see in the US anymore unless one of these kids is brought in from the outside world. HomeTonight4Eve:10:42Home. Tonight. Forever by the Baby Blue Sound Collective, I think what I love so much about this CD is that some of the songs were inspired by the patients. Many listeners will understand many of the different songs and what they've been inspired by. Our new album will be available on iTunes, Amazon.com, Spotify. I love the fact that the proceeds from this CD are actually going to help those with congenital heart defects. Enjoy the music. Home. Tonight. Forever. Promo:11:08You are listening to Heart to Heart with Anna. If you have a question or comment that you would like addressed on our show, please send an email to Anna Jaworski at Anna@HearttoHeartwithAnna.com. That's Anna@HearttoHeartwithAnna.com. Now back to Heart to Heart with Anna. Anna Jaworski:11:37Before the break you were telling us about your amazing program and I think you're going to have a lot of people who hear this show who say, "Hey, I'm interested in that!" So tell me, you already said you have some full-time staffers and you have some part-time surgeons, but we both know it takes a lot more than just a surgeon to have these children have a successful outcome. You need nurses, the anesthesiologists and so many people. Tell me about the team that you actually take to provide care to these children around the world. Dr. Bill Novick:12:11So, Anna, it depends a little bit on where we're going, but I would say let's just take a generic team that is early in a program development. So there is a senior level, pediatric cardiac surgeon, pediatric cardiac anesthesiologist, a cardiac scrub nurse, and then the perfusionist who runs a heart lung machine and that's the operating room team. Then we take typically two pediatric cardiac intensivists, one pediatric cardiac nurse practitioner, advanced nurse practitioner. So those were all master's level people. One ICU nurse educator, okay that's actually a certified position and then anywhere from three to six additional pediatric cardiac ICU nurses, a pediatric cardiologist, a pediatric respiratory therapist, and a biomedical engineer. Anna Jaworski:13:07Oh, a biomedical engineer? Now that's a surprise. I didn't expect you to say that. Why do you have a biomedical engineer? Dr. Bill Novick:13:15So a lot of these places that we traveled to, either we have donated the refurbished equipment or they are using equipment which is more than 20 to 25 years old. So what you don't want to have to worry about is something breaks and it shuts your program down. That's a disaster. So we are, I guess heavily dependent upon them being sort of a jack-of-all trades. So not only can they fix the ventilator but they can also fix the monitor. They can fix the bypass machine; they can fix the syringe pumps. Anna Jaworski:13:50So, you have your own Geek Squad. Dr. Bill Novick:13:52Oh yeah. Oh, Geek Squad! Dr. Bill Novick:13:59We do. And I think this is critical and, and people in the United States, principally actually people in the United States and Canada, as well as Western Europe, have no idea of the magnitude of the problem the children around the world with heart disease face because they have deficient or quite frankly, completely absent pediatric cardiac services. So we believe that it's important to network and raise awareness and we also like to encourage those that are going into the medical field at a very early age. We like to encourage them to feel like an important part of their future is outreach support for those less fortunate than us. So what does all that mean? So we take high school students, we take medical students, we take surgical and pediatric residents and fellows, but we also take media personnel. So we've taken videographers, we've taken newspaper columnists, we've taken magazine freelance writers. We've taken sponsors on these trips. Anna Jaworski:15:06I'm sure that's very rewarding to them to actually go there and see the children, that their money is being put out to help. Dr. Bill Novick:15:15Well, we like to let them see firsthand and to experience it firsthand. We have taken sponsors to China, Croatia, Russia, Peru, Ecuador, Dominican Republic, Kurdistan, Uzbekistan. Anna Jaworski:15:34Okay, let me stop you there. You are going to places that a lot of people might consider extremely dangerous, especially as Americans. How do you deal with that? Do you have to bring your own armed guards? Dr. Bill Novick:15:47Uh, no. Oh my goodness. Can you imagine the size of the team? Anna Jaworski:15:51No, I can't. That's what I'm saying. I mean you're taking millions of dollars worth of equipment and personnel to places that probably a lot of people would be afraid to go. Dr. Bill Novick:16:03We have in the past used security agencies to make strategic security assessments. They've done that for us both in Iraq and in Libya. Depending upon the sponsoring organization, so sometimes they have the resources to do that. It's unusual, but sometimes they do. For instance, I'm not sure my conservative colleagues are going to like this statement, but that's okay. We've been funded by the George Soros Foundation many years ago for a number of our trips throughout Central Asia and Kurdistan, Uzbekistan, etc. The Soros Foundation has the ability and the resources to make a strategic security assessment. I can tell you that in most of the places where the US was involved either in conflict currently or relatively recently, that the team is usually protected by a 24-hour armed guard. So Iraq and Libya and Iran, because we do go into Iran, we have 24-hour armed guards and we traveled to the hospital from the hotel in vehicles that carry individuals that are armed. So there's a great deal of concern about our security. As you can imagine, it would be a disaster for the hosting government to have anything happen to us. Anna Jaworski:17:25I think it's brave of you and all of the people working with you that you're willing to forego the politics that we see so rampant in the news all the time to really focus on what's important and that is these children with broken hearts and their families. So you've been working with children all over the world for over 20 years. What's the biggest change that you have seen in the two decades that you've been helping these children globally? Dr. Bill Novick:17:50I would say the biggest change that I've noticed is that more groups have become involved in this, in both the United States and Europe. When I started back in 1993, this was rare. There were probably not three or four groups in the entire world that were really pushing this. There were two in Europe, there was one in Italy and there was one in France. There was our group here, and then there was another group up in New York and that was about it back in '93. Now, my goodness gracious, you've got a couple of programs in the state of Texas that are doing this kind of work. Anna Jaworski:18:24That's right, HeartGift is one of them. Dr. Bill Novick:18:26Yeah. There were two or three groups out in California now. The Mayo Clinic is doing this kind of work now. Literally there's probably close to 50 groups in the US doing this kind of work now. But most of those groups make one or two -- maybe trips a year. I think the only group that actually, there are only two groups that actually probably come close anywhere near close to us in number of trips, a group called CardioStart based out of Tampa. Very good people, their founder and executive director I've known for years, and then ICHF who makes about 11 to 13 trips a year. Unless you have created an entity either within your university system or as a 501(c)(3) nonprofit, that function is to provide the service of clinical services, education, training and teaching. Then how can you afford to take off. You really can't, so it has to be an organized effort either at the university level or you've got to create a 501(c)(3) to do it. Anna Jaworski:19:31Wow. So you're making a huge difference just because of the numbers of trips that you're making and the number of children that you're helping every year. Anna Jaworski:20:52I'm sure, and relief. Dr. Bill Novick:20:54And if we don't leave behind somebody who can operate on those children, the children of the future in that country or that institution, then we feel like we failed. Yes, I know we did 500 kids at this place, but if we didn't leave somebody behind, that could still operate, ooh, it really doesn't sit very well with us. We're really focused on providing the clinical service as 1A, and 1B is creating a local team that is sustainable over time, so the children of future in that reference area, in that region can receive surgery. Announcer:21:33Heart to Heart with Anna a presentation of Hearts United the Globe and as part of the HUG podcast, network. Hearts Unite The Globe is a nonprofit organization devoted to providing resources to the congenital heart defect community to uplift, empower, and enrich the lives of our community members. If you would like access to free resources pertaining to the CHD community, please visit our website at www.CongenitalHeartDefects.com. For information about CHD, the hospitals that treat children with CHD, summer camps for CHD survivors, and much, much more. H2HwMichael:22:09"Texas Heart Institute were offering us a mechanical heart and he said, "No, Dad, I've had enough. Give it to someone who's worthy." "My father promised me a golden dress to twirl in. He held my hand and asked me where I wanted to go." "Whatever strife or conflict that we experienced in our long career together was always healed by humor." Heart to Heart with Michael... please join us every Thursday at noon Eastern as we talk with people from around the world who have experienced those most difficult moments. Anna Jaworski:22:38I think it's amazing that what started out as a handful of different organizations going and serving the global congenital heart defect community has mushroomed into many, many, and even if some of these organizations are only doing one or two trips, everybody's working in harmony, which I think is amazing. I mean you're all with the same vision that you know, there are other children in other countries who need your help, but I love your vision that it's not enough to go and provide the surgeries, but you have to train the people because those of us who are in the heart world know, things are going to happen. So are you providing continuing education for these people as we see things evolve? What we're seeing here in the States is that a lot of the Fontaners, as they age, are starting to develop liver issues. Are the people that you're leaving behind, are they going to be trained to look for those kind of problems as their population ages? Dr. Bill Novick:23:32There's continuing knowledge that is occurring. A continuing search for the causes of congenital heart disease, for the complications of repaired congenital heart disease. So the knowledge base for congenital heart disease is nowhere near finished, so you need to be learning all the time. So we encourage that by a number of mechanisms. We make repeat visits so if we haven't visited a place say in three or four years and we know there's some additional things that we have learned over time, this three or four year absence, we will frequently make another trip back and discuss some of the issues. Sometimes on those trips we make actually a plan ahead of time because some new technique has come out so we will say, okay, line up the following. Okay, we want to show you this. Two years ago, a 29-year-old girl from Ukraine got in touch with me on Facebook and said, "Dr. Novick, I'm having some trouble with my Fontan that you did on me 22 years ago." Okay. Now, the institution that we had been traveling to when I performed that Fontan on her back in 1994 was an institution which has graduated over time from our program, but we're at another institution. So I said, listen, why don't you come. I'm going to be in Ukraine, I'm going to be in this city, why don't you come down and visit me and let's do an a eval on you. And sure enough, she had an old atrial pulmonary Fontan and was in atrial fibrillation. She was a Tricuspid Atresia, she had mitral regurg which needed attending to. Her right atrium had gotten gigantic. Okay. She was a failing late Fontan. So I spent a lot of time with her evaluation, teaching the locals that this does happen. That there are children that survived the early Fontan experience that you need to look at and these are the things that you need to evaluate when you're evaluating an old real Fontan. Um, and then we operated on her there. So she got a Fontan take-down, extra-cardiac conduit, mitral valve repair, and bi-atrial Maze Procedure done on her. And so she was wonderful. She was a supermodel in Ukraine and a spokesperson for the Ukrainian Ministry of Culture, later on, after she stopped being a supermodel. And she wanted to become a mom and that's why she contacted me. She said, "Nobody here can take care of this. You know, I need you to come back." Dr. Bill Novick:25:59So that happens in a lot of places. I mean I've made special trips just myself into Peru to teach the Fontan operation to our colleagues down there. We spent many, many years in Peru, but we didn't do a lot of Fontans during that time. So they've picked up on all the Bi-directional Glenns and now they're starting to do Fontans and say, "Novick, can you come down and show us just a few of these?" I've been asked to come back out to Siberia and teach the ropes out there to groups. These are groups that have graduated from our program. So continuing medical education? Yes, they all get it. We have research projects in pulmonary hypertension and alternative materials for right ventricular pulmonary artery continuity and reconstruction, for the use of various new products that have been coming out that allow you to repair aortic arches or make your own conduit. So multiple research projects will require us to be re-involved or continually involved with a number of patients in countries that we previously had sent on their merry way to be graduates, but now they're involved in research projects with us. Dr. Bill Novick:27:08We were in Moscow in May at the Asian Society of Cardiovascular and Thoracic Surgery, presenting our combined data from our Pakistan program and our program on a new method of dealing with residual right ventricular outflow tract obstruction after tetralogy repair. So we combined our data with their data. We haven't been in Pakistan since 2010, so that of course led to, well geez, can we combine our data on this? So now I'm flying to Cartagena for the STS, Society of Thoracic Surgery, European Association of Cardiothoracic Surgery combined Second Latin American Conference and I'm presenting our combined over 600 Bi-directional Glenns and how we try and operate on them more cost effectively by not using the pump if we don't have to use the pump. So this is something that is for us, an important part of our work, continuing medical education and research. Anna Jaworski:28:10Well, I'm sure by the time my Listeners have heard all of this, they are going to be as inspired as I feel and they may want to donate to your organization. How can they make a donation to help you to continue your mission? Dr. Bill Novick:28:27Well, I think the easiest way to do that is to simply go online to our webpage, cardiacalliance.org, and there is a donate page there. If there are healthcare professionals that tune into the podcast and say, "Geez, how can I volunteer?" Guess what? There's also a volunteer page there. You can volunteer right online. The more funds that we raise, the more trips we can make, the more local healthcare professionals we can educate and the more kids we can operate on. I think we're very good stewards of people's money. We keep our administrative costs in single digits for the most part. Anna Jaworski:29:06Well, I had Roslyn Rivera on my show a couple years ago and I was so impressed with her, so I'm so happy that she told me about what she's doing with you and the fact that she is a Heart Warrior herself, turning around and reaching out to children all over the world who have a condition like her. I just think it's amazing. The work that you're doing is fabulous. I really appreciate you taking the time to share your story with me and I know there's a lot more to this story than this, but I feel like I am inspired. I wish I knew how to work on hearts. What I can help you do is spread the word through my podcast and through my website and I want to thank you again for coming on the show today. Dr. Bill Novick:29:49Listen Anna, I really appreciate it. It's a very important part of the work that we do for individuals in countries that have the possibility to care for their own children to understand that 90 percent of the kids in the world that have heart disease don't have those opportunities. So spreading awareness is fantastic and we really appreciate the opportunity to participate in this podcast and we'll be happy to do it in the future if you would like for Part 2. Anna Jaworski:30:16Absolutley. We'll count on that. But that does conclude this episode of Heart to Heart with Anna. Thanks for listening today, my friends. Find us on YouTube. Just look up my name, Anna Jaworski, and subscribe. And remember my friends, you are not alone. Conclusion:30:32Thank you again for joining us this week. We hope you have been inspired and empowered to become an advocate for the congenital heart defect community. Heart to Heart with Anna, with your Host, Anna Jaworski, can be heard every Tuesday at 12 noon Eastern Time.